"Suddenly a shooting star blazed over the treetops. Spottedleaf's tail twitched and the fur along her spine bristled. Bluestar's ears pricked but she remained silent as Spottedleaf continued to gaze upward. 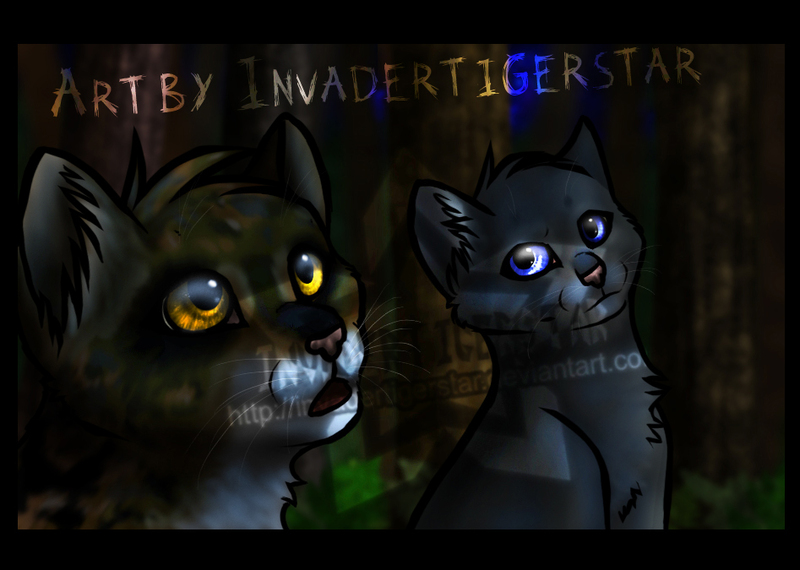 After a few moments, Spottedleaf lowered her head and turned to Bluestar. A distant look came into her eyes. "Fire alone can save our Clan."" I can't even tell you how happy I am with this. Or how many fails it took to make this pictures. This is the first of many more Warriors pictures I plan to do. BEAUTIFUL lighting! The dark blue black makes it so mystic. You captured this scene beautifully! The tortoiseshell pelt is gorgeous on Spottedleaf! the eyes..... how do you DO that?! make them looks so realistic and.... luminous....? well yeah, but HOW? do you just make lines over and over? ._. sorta... I start with a really dark shade of the color and then i go over it with the dodge tool around the pupil, and then I do little lines coming out from the pupil to the outside of the eye to add the ... wrinkles? Dunno what they are XD. and then sometimes I go back over with the burn tool to add more texture.